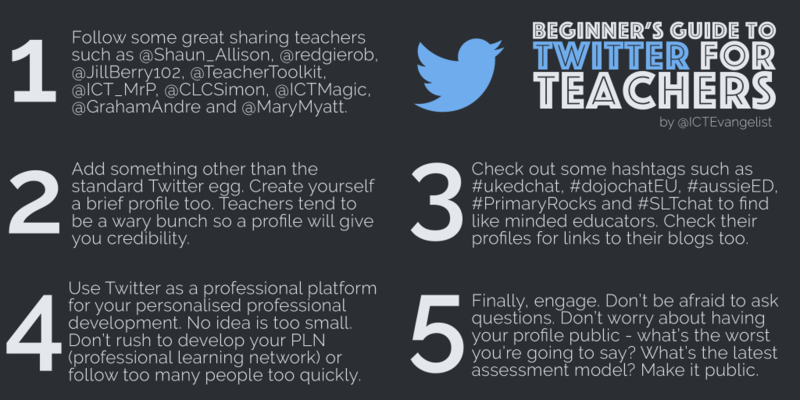 I wrote quite a long, detailed guide to Twitter for teachers back in April last year. It proved really popular, but it wasn’t really staffroom fodder and didn’t really fit onto a presentation slide either. With that in mind, I created a crib sheet version. I haven’t included one of the most basic pieces of advice which is do not follow or engage in conversations with pupils / students. This I think should be a given so I haven’t included it. You should also take great care to check your school’s social media policy for guidance. For the rest of it, it basically looks at some of the simple things you can do as a teacher once you’ve got your account set up. If you think I’ve missed something particularly salient, please do let me know in the comments; I could always update it! Think it’s fab! Just wondered whether it’s worth explaining what PLN means for the uninitiated? …but it already does Jill? Thanks for the advice, Jill. Updated. Poor reading skills on my part? !